New Delhi: Chief Minister Dr Mukul Sangma has asked for more investment in Meghalaya by the Centre to facilitate economic growth at higher rate in the hill State and mooted stronger economic and strategic ties with neighbouring SAARC nations. 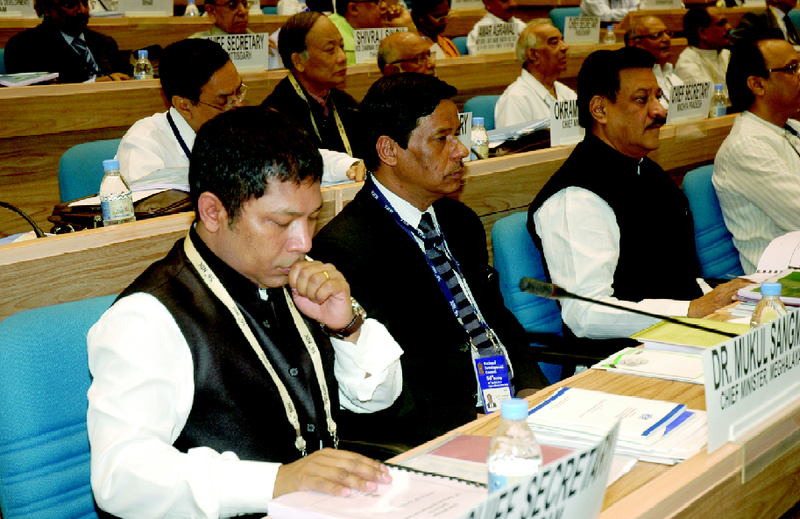 Addressing the 56th meeting of the National Development Council here, Dr Sangma said the hill State had the potential to achieve a growth rate of 9 per cent against the national average of 8.2 per cent provided there was more investment by the Central government. “The State needs to grow at 11 per cent if it has to catch up with the rest of the country by 2030 since the State is lagging behind in the national per capita income,” he said. While agreeing with general tenor and approach of the approach paper for the 12th plan, Dr Sangma said emphasis for the Northeastern states must be on bridging the infrastructure gap besides accelerating a sustainable, inclusive and rapid economic growth to ensure equitable economic development of the country. The Chief Minister said the opportunities for rapid growth that could be availed by way of strengthening economic and strategic cooperation with neighbouring SAARC nations must also get due emphasis in the Twelfth Plan. “The investment required for the region will have to come primarily from the public sector since there is little scope for investment either from private sector or through public private partnerships,” Dr Sangma said. He mentioned about the “Integrated Basin and Livelihood Development Programme” launched by the State Government for inclusive growth with a focus on poverty alleviation, generation of employment and livelihood options. “Under this flagship programme, we are making several interventions in mission mode in areas like horticulture, aquaculture, animal husbandry, sericulture & weaving, apiculture, energy, water and natural resource management,” he said. “Since agriculture is the mainstay of 70% of the State’s population, priority has to be given for agriculture with strong emphasis on horticulture and plantation crops. But, to transform the agriculture sector from subsistence to commercial farming, significant capacity building is needed in technology adoption and marketing. So, assistance from the Government of India in both financial and technical aspects is vital for the State’s agricultural development,” he said. “The State’s foray into high-value and low-volume crops namely, strawberry and commercial floriculture like rose, lilium, gerbera, chrysanthemum, anthurium, carnation, birds of paradise has helped us penetrate national and international markets,” the Chief Minister said adding that there is plan to upscale volume of production of high value horticulture crops. On infrastructure front, the Chief Minister mentioned about the initiative for upgradation of major district roads and state highways and asked for one-time financial assistance for this purpose. Dr Sangma appreciated the Centre’s initiative for conversion of the arterial NH-40 into four-lane road between Shillong and Guwahati as well as along the Shillong Bypass. “Besides this, the 2-laning of the intra-State Shillong-Nongstoin-Tura road has started and the State expects that the construction of 2-lane Jowai Bypass and the expansion of certain portions of NH-51 including construction of Tura Bypass will commence during the first part of the Twelfth Plan period,” Dr Sangma said. The Chief Minister asked for central assistance as well as institutional funding to tap the hydro power potential of the State estimated at 3000 MW given the high cost of generation. He also mentioned that a number of hydro power projects were being planned for implementation during the Twelfth Plan period.